Over the past week or so I got some great freebies in the mail that I wanted to share you all! First off, some of my Garnier Fructis Sampler packs arrived, the Grow Strong and Damage Eraser. If you recall earlier this month there were lots of different sampler packs available, they were gone pretty quickly, hopefully you could grab some. I was surprised that the Garnier samplers came with full-size shampoo and conditioner bottles! 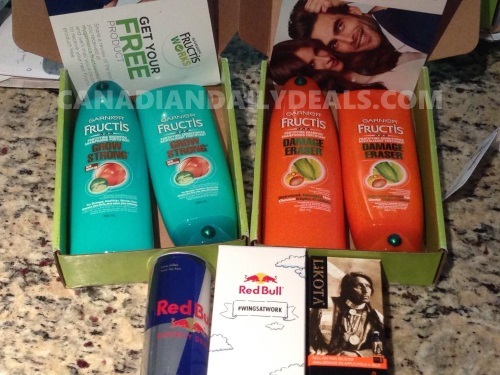 Also there was a card with each sampler with a link to write a review and get another coupon for a Free Garnier Fructis product, so be sure to complete that for yet another freebie! Then, I also got a Free bottle of Redbull! I was surprised to see an actual bottle and not just a coupon from this promotion. We posted this a couple of weeks ago, Redbull offers freebies from time to time so definitely keep a lookout for more to come. Lastly, I got a full size Lakota Arthritis Pain Relief bottle to try out from SocialNature. I am excited to try this out as well. For more information about Social Nature, click here. What did you get in the mail recently? Please let us know on our Facebook Page here.